Haynes Family: "O Christmas Tree"
We got all our Christmas decorations out and up. Jaeden helped decorate the whole tree. She was very excited. Every morning she reminds us to plug in our tree and loves to take naps with her Santa hat on. Avery likes to squat down and smile at her reflection in the bulbs, very cute! Does she really just LOOK at the bulbs??? There is no touching involved, or breaking, or dis-assembling?? If so then I just might hate you!! 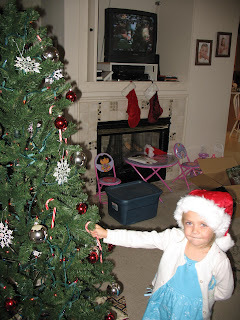 I get to re-decorate my tree 3-5 times a day!! Such a cute little miss santa! I want you to come for Christmas, can I cast a spell over the internet? Angie, come for christmas, come for Christmas, come for Christmas. Did it work? Give Jaeden and Avery a big fat kiss from their Aunties! Love the hat! She looks so sweet!